Mega plc Construction Company has been into the property development business since 1996. Our projects are based in environmentally friendly solutions and designs compatible to the local architecture, with respect to the unique environment of the island. Δ 17a/141/3/Φ.Ν. 275 (Ε.Α.Κ. 2000). Our constructions also meet the strict standards of Euro codes 3, 4 and 8. Villas can be built in two different ways, namely conventional (brick walls & plaster) or stone way. Apartments can only be found in buildings constructed with the conventional way. General excavation and foundation to the appropriate depth depending on whether a basement exists or not and until stable ground is achieved. The surface of the excavation will be graded with concrete to allow for better setting of foundation and prevent oxidation of reinforced steel used. Casting and construction of foundation with high quality reinforced concrete as per the static specifications ensuring excellent concrete performance. All of the above are first wood formed and then reinforced with steel according to specifications. They are then covered with high quality concrete and exterior surfaces of reinforced concrete are covered with an insulating material, wherever required, for excellent heat insulation of building. Exterior walls are composed of double brick skin cavity with an insulation filling and the construction of two reinforced cement rings, one at the height of the window sills and one at the window and door headers for better performance of building. Interior walls are constructed with a single brick skin and with two reinforced cement rings at the same height as the exterior walls. In the case of stone villas, the exterior walls are made with local stone from the Zakynthian Mountains, 50cm in width. Interior walls remain the same. Roof is constructed with Swedish timber. Thickness according to static specifications of the supporting wood. It is internally lined with Swedish timber and varnished or painted with oil paints, having the capability to use colours of your choice. Externally the roof is lined with a tar film for water - proofing and a heat insulating material are applied. The ceramic roof tiles are then placed. The electrical connection is achieved through a current gauge, which is placed outside the house, by the power supply company, leading to the main distribution / fuse box located inside the house and to all rooms through the wiring in the walls. All wiring can be monitored through shunt boxes at various points. The wiring leads from the distribution / fuse box to the different lighting points, switches, sockets etc. Each room includes a full installation of lighting points, switches, sockets, TV and telephone points. The main fuse board is equipped with a safety circuit breaker and individual fuses for the water pump, stove etc. Light fittings and their installation are the customer's responsibility. Underground plumbing via a water metre, placed by the municipality, leading from boundary of property towards distribution box located inside the house. Inside the house the installation course is beneath the flooring, inside spiral conduits in case replacement of a water pipe becomes necessary, which end up at the different points - kitchen, lavatories, and exterior taps etc. Through a back up water tank whose capacity is 1 ton and a water pump, the dwelling has a back up water supply even when there is a municipality water shortage. All sanitary articles for lavatories as well as accessories, hot - cold water taps including tap for kitchen sink and connections for washing machine. The dwelling's waste connection leads to drainage network, where existent, or to an absorbent septic tank. Inner and outer walls are plastered, as shown in views, in three coats. One of splashed plaster for better adhesion of material on surface. The second, a rough coat and the final coat, a thinner, fine layer of plaster for a smooth surface. On outer walls a net is placed between main construction and brick walls for the better bonding of the plaster. Outer and inner floors, verandas and staircases are tiled. A great selection of tiles is available. At points where tiles change (e.g. doors etc), marble is placed. All internal doors have a wooden frame and are lined with MDF, in a wide selection of colours and styles. All external doors, windows and shutters are composed of white aluminium or PVC frames (sliding or opening) and include doorknobs or handles, accessories and window or door panes. On the main entrance door a new safety cylinder is placed upon completion of construction. Bedroom wardrobes, whether or not they are built-in, depending on specifications, include drawers, shelves and hanging rails. The frame is made of melamine and the doors of MDF, either in the colour of wood or in any other colour from our selection. The cupboards are installed on the floor and on the wall, according to the plans, and include worktops, a double sink with a drainer, a hot - cold water tap, a kitchen exhaust fan etc. All cupboard frames are made of melamine and the doors are MDF in the colour of wood or any other colour of your choice. Walls between worktops and upper cupboards are tiled with your choice of tiles. Electrical appliances (e.g. stove, fridge etc.) are not included. 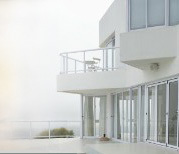 External walls are painted with the highest quality paint. Internal walls and ceiling are painted with paint for interior surfaces in a selection of colours. Sloping roofs, doors, windows, shutters etc. are varnished or painted with a colour of your choice. Exterior work, such as lighting points ready for installation of light fittings, water and airtight sockets and taps on verandas will be completed. Driveway and parking spaces are gravelled. • Air Conditions (cooling and heating), Inverter Type. • Bathtubs, toilets, washbasins, stainless steel sink and tap for the bathrooms and the kitchen. Upon delivery the building is inspected by the client and all abeyances concerning the Greek Social Security Association and the Minimum Construction Cost will have been settled for the granting of the final power supply of the house.